You are a Startup or SME? You are looking for access to finance or need some coaching to fine-tune your growth strategy? You cannot afford high quality consulting expertise? 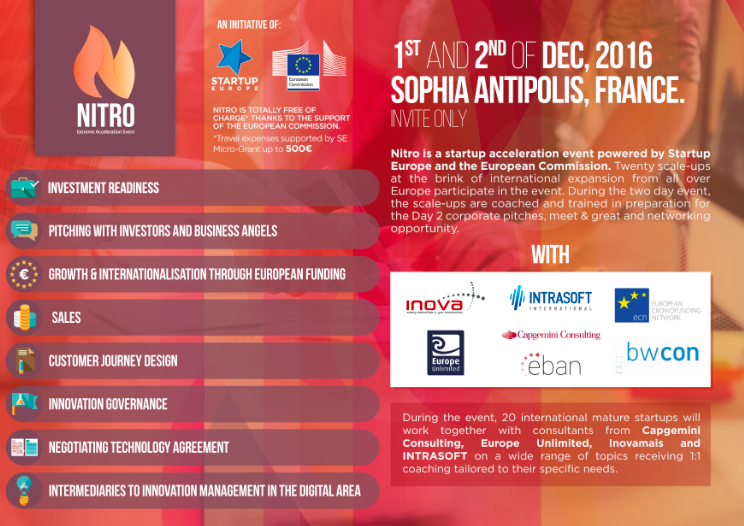 Then apply until October 31 to the NITRO Event, taking place December 1-2, in Sophia Antipolis, France. High level experts from Capgemini Consulting, Europe Unlimited, Inovamais, INTRASOFT, the European Crowdfunding Network, and the European Business Angels Network will work with 20 selected SMEs in small workshops on exactly these questions that are relevant for you to grow your business. Thanks to the ePlus Project, this event is totally free of charge! Travel costs can also be covered up to 500 EUR!